The unique format of this book will get students talking whether they’re actors or not! Duologues are not scenes for two people; rather, they are a pair of monologues about the same subject but from different viewpoints. Likewise, triologues offer three perspectives on the same topic, without the actors ever interacting. These can be great tools for opening up subjects for discussion or debate. Even the standard single monologues including in this creative collection touch on issues ripe for discussion for middle and high school students. The subject material of all these monologues, ranging from one to three minutes maximum, is honest and true to life. Read more...Best of all, you don’t have to worry about inappropriate language or situations. These monologues don’t skirt important issues that teens face today, but each situation is handled in a way that allows the actor, not the language, to be center stage. Monologues range from light-hearted topics — blind dates, babysitting blues, and fender benders — to more sensitive ones such as family problems, drunk driving, and suicide. 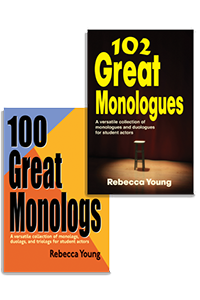 You loved her 100 Great Monologues so much that Rebecca Young has generated a new book of fresh monologues and duologues specifically written for teens of today. Keep in mind that duologues are not scenes for two people. Rather, they are a pair of monologues about the same subject from two different viewpoints. This book gives tribute to the many facets that make up the typical teenage life. All the emotional ups and downs have been captured in ways that both the actor and the audience can easily connect to. Each monologue is short and easy to memorize and perfect for auditions, competition, class presentations, and more! Titles include “Teenage Vampire,” “Fender Bender,” “Tattoos are Forever,” “Where’s the White Bread?” and many more!